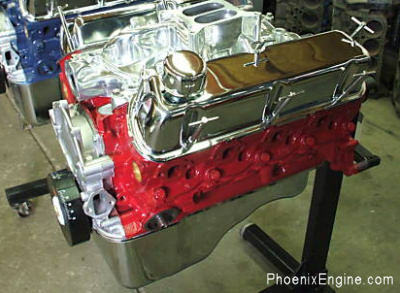 A "Crate Engine" means "Intake to Pan." 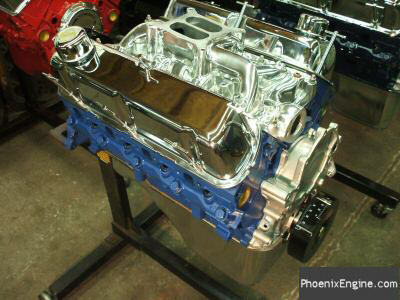 Just give us a call if you'd like this engine in a TURNKEY package! Turnkey packages start from $995 to $1095 to $1195 addded to the crate engine price. (This one has great vacuum, great low end mid range and mileage. 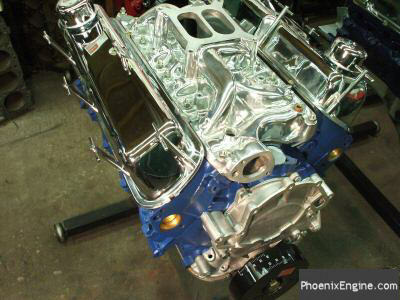 Click HERE to see bigger 4x4 engines. PLEASE CALL FOR PROMOTIONAL PRICING AND SALES! 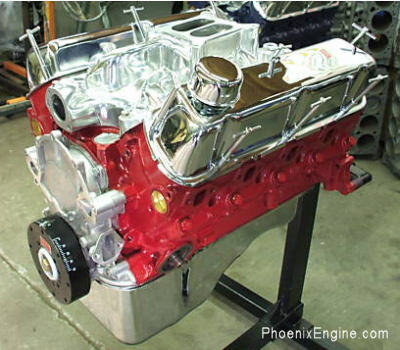 This Power 1 or Power 2 Engine is great for the everyday driver, in your MUSCLECAR, Street Rod, Custom Truck, 4x4, or JEEP. A sample: This 331 HP engine has a MILD to ROUGH idle with a Comp Cam Kit CAM, 5400 rpm and 348 ft lbs of torque. You will need an 1800 to 2100 Stall Speed Converter for this engine. 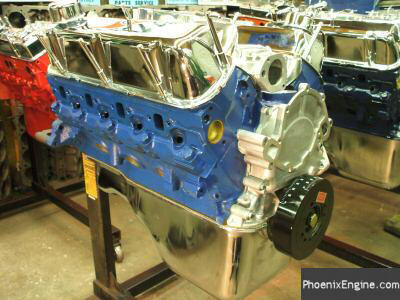 This Engine is a Seasoned Heavy Duty Hand Picked Block. NEW KEITH BLACK PISTON ENGINES! New Satin Aluminum intake manifold. 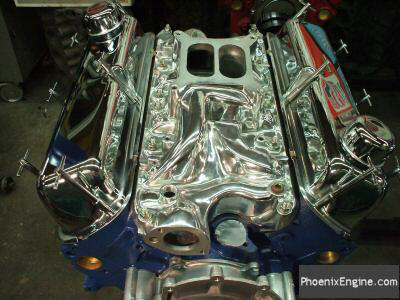 Polished RPM dual plane intake manifold is extra. New Pro High Performance Harmonic Balancer. Built from one of our Dyno tested and road proven packages. Your specific engine can be Dyno tested for an additional charge. What comes with your Power 2® engine? 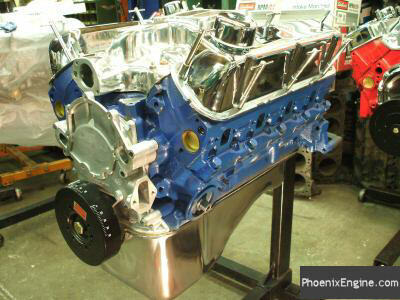 Here's a listing of the parts and machine labor for your Power2® engine from PhoenixEngine.com. This engine will run on Premium unleaded fuel. Ask us about our Carburator and Electronic distributor package for this type of Power Engine! We also have TURNKEY PACKAGES for any of these motors! 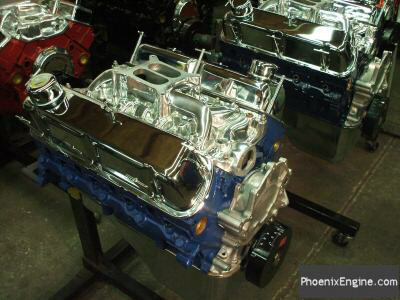 COMES COMPLETELY ASSEMBLED, INTAKE TO PAN. 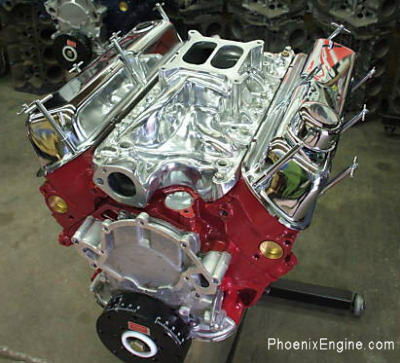 All our engines are custom hand built including 289 - 302 - 351c - 351m - 351w - 400m - 390 - 427 - 429 - 429 - 460 and more. SPECIAL PROMO!! Call NOW for FREE SHIPPING to Southern California! We also offer super shipping rates to all 48 continental states.